The Ethiopian government has denied blocking aid and trade to parts of its southeastern Somali region, but analysts and aid agencies say humanitarian access is limited and rising prices of food are evidence of security-related restrictions. "It is a lie. It is far from the truth. There is no humanitarian operation we have banned. We are not closing any route of humanitarian operation; however, we closed the illegal trade routes crossing the border," Jama Ahmed Jama, vice president of the Somali regional state, told IRIN. Since May, analysts and media reports say the government has stepped up security operations to combat the rebel Ogaden National Liberation Front (O.N.L.F. ), including tightening controls on the flow of goods and people within the region, with neighboring Somalia, and with the rest of Ethiopia. 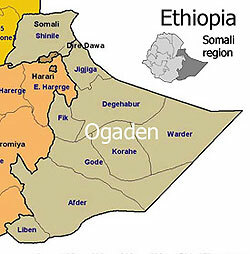 The Ogaden area is in the southern part of the Somali region. Ethiopian security forces have been accused of a range of serious human rights abuses in the operation. Peter Takirambudde, Africa director of Human Rights Watch (H.R.W. ), is quoted in a July 4 report saying: "Ethiopian troops are destroying villages and property, confiscating livestock, and forcing civilians to relocate. Whatever the military strategy behind them, these abuses violate the laws of war." The alleged relocation of civilians, said a regional analyst speaking to IRIN from the United Kingdom, was part of a "classic counter-insurgency" campaign to deny rebels access to support from the civilian population. H.R.W. said: "The attacks on villages and the economic blockade may be part of a strategy to force thousands of people from rural areas to larger towns and deny the O.N.L.F. a support base." Media access has also been restricted, with New York Times journalists reporting in the region detained and questioned for five days in May. The combination of restrictions on trade and movement, the high risk of flooding between July and September reported by the National Meteorological Agency, and the progression of the dry season means there is a high risk that the food security situation could deteriorate into a severe humanitarian crisis in the second half of 2007, according to a statement issued by the United Nations Office for the Coordination of Humanitarian Affairs (O.C.H.A.). Five zones in the Somali region—Fik, Degehabur, Warder, Korahe, and Gode (in the Ogaden)—are under "military operation," according to United Nations reports. Restrictions on food aid to those zones were lifted in principle on July 21, according to an announcement by the regional state authorities, said O.C.H.A., but not yet realized. Food aid is being distributed to three of the region's nine zones. Emergency food aid allocations are based on estimates of 530,000 people in need across the Somali region. Food and other humanitarian needs are being reassessed by aid agencies and the government in a joint process following the Gu season rains. Only a few humanitarian agencies are active in the Ogaden region. The International Committee of the Red Cross was given seven days' notice to leave the area this week, and issued a statement on July 26 "deploring" the decision and underlining all parties' "obligation to comply with international humanitarian law, in particular with that law's prohibition of attacks against people not or no longer taking direct part in hostilities, and the right guaranteed by that law to civilians to receive the humanitarian assistance essential to their survival." The Famine Early Warning System Network (FEWS Net) said in a July 19 report that markets had been affected since mid-June, with food prices doubling in Warder and Korahe from May to June. As an example, 50 kilograms of rice had risen to 500 Ethiopian birr ($55) in June from 220 birr ($24) in May. The region, which has faced conflict, drought, and floods over recent years, is poor and vulnerable: "Even small shocks can quickly result in extreme food insecurity," said FEWS Net. The largely pastoralist region depends on livestock for barter and trade. "At the same time, because the normal market for livestock in these areas is outside the areas where movement is restricted, herders are unable to access the markets and sell their livestock," reported FEWS Net. The O.N.L.F. accused the government of using food as a weapon. O.N.L.F. spokesman Abdirahman Mahdi told IRIN on July 24 there was a total blockade of the region by the Ethiopian government. "Nothing is entering the region whether it is commercial or aid. The situation is most desperate in Warder, Korahey, Dagahabur, Fik, Dhuxun, and Gode." He alleged the Ethiopian military was taking or destroying what little food stocks the people had. "Villages and nomadic homes have been torched by the Ethiopian forces. They want to starve the people into submission. Food donated by Western taxpayers is being used as a weapon of war by the Ethiopian regime." He called on the international community, particularly the United Nations, "to act now to avert a catastrophe or they will be complicit in the crimes being committed by the Ethiopian government in the Ogaden." Regional state vice president Jama, however, denied there was any food crisis in the region. "The food aid is currently in distribution. We do not have any report on hand that showed any type of food crisis in the region.